"El Martillo SL28 from El Salvador and Dimtu Espresso from Ethiopia." Two years ago, we introduced our first two festive coffees for the holiday season and last year brought you two more. Now entering our third consecutive year of bringing you a couple of felicitously festive-tasting coffees, it’s safe to call it a tradition. For our filter range, we're excited to have secured this year’s slightly larger crop of SL28 variety coffee. Grown by the Salaverria brothers on the El Martillo plot of their Finca San Francisco estate in El Salvador, 2017 was the first time these young trees, planted in 2014, had produced enough seeds to properly process and export. We were able to purchase both a washed and a red honey version of the tiny production. "The El Martillo tablón on the Salaverria's Finca San Francisco estate is planted out with a range of unusual varieties, including SL28, Yellow Icatu and Orange Bourbon." "Raoul is the lab manager responsible for roasting samples of the wide range of lots processed at the Las Cruces mill in Santa Ana, El Salvador." This year, based on feedback from ourselves and our customers as to which lot was better received, the brothers have processed the entire production as a full honey process (also referred to as a 'black honey process'). The 2018 harvest in El Salvador was particularly challenging for a number of reasons, and we've found all our coffees from the country to have been dialled back in intensity compared to years past. However, El Martillo SL28 is still tasting complex, full of botanical and herbal aromas as well as notes of preserved fruit and a delicately boozy quality. In the roastery, we've been experimenting with slightly more concentrated brewing recipes, achieving our favourite results when using between 65 and 70 grams of coffee per litre for pourover brewing, rather than our more usual 60g per litre, as we’ve found the slightly increased strength and concentration of flavour works really well for this coffee. Also, with the days getting shorter and the mornings darker, who wouldn’t appreciate that 10% dose increase in their morning coffee? "Try out a recipe of 33g to 500g water for a little extra concentration and vibrancy when brewing the El Martillo SL28." With regards to our espresso range, in the past we've typically highlighted coffees from Rwanda and Burundi that conjure up Christmassy flavours. We reliably get lots of honeyed baking spices in our Gitesi Espresso and coffees from Mahembe in Rwanda or Buziraguhindwa and Mbirizi in Burundi tend to bring a lot of jammy fruit preserves and redcurrant notes, very fitting for the time of year. However, our Burundian offerings this year have only just landed, and our coffees from Rwanda’s harvest in June-July this summer are still making their way to the UK. Luckily, we’ve been profiling an espresso from Ethiopia that we are imminently releasing, from someone fast becoming a household name at Workshop: Israel Degfa. 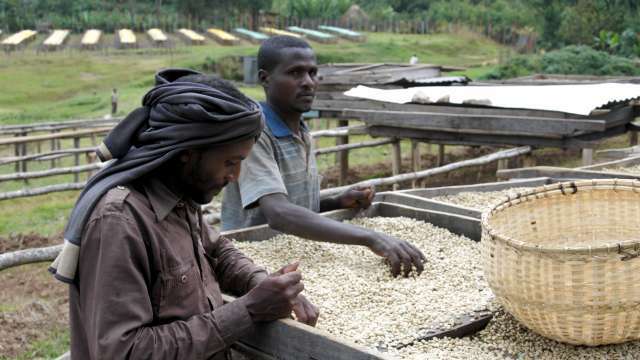 "Israel Degfa owns around 20 washing stations in Southern and Western Ethiopia, and is focussing on producing high quality coffees as opposed to solely large volumes." This lot was processed at the Dimtu washing station in the Hambela woreda of Ethiopia’s famed Guji Zone. It has some very classic washed Ethiopian traits, being very perfumed and floral, but what we really love about it is the concentrated berry flavour, as well as dark chocolate and baking spice notes. The flavour, texture, sweetness and tartness make us think of sticky Christmas pudding, with all of its syrupy, steeped, dried fruits. When you’re layering up and everything is misty windows and long shadows at 3:30 in the afternoon, it seems to us a very fitting coffee to be drinking. "Bags of sticky sweetness, tart dried fruits, florals and baking spices to boot, Dimtu Espresso is making us feel very Christmassy!" "Move over PSL, Dimtu in milk tastes like berry yoghurt, honey and gingerbread." One of the joys of spring, in our minds anyway, is the arrival of fresh crop coffees from Africa. Something we look forward to intently, especially on the back of Tim's trips to origin, followed by his subsequent reports on how great certain things were tasting, 2015 hasn't disappointed. Our third year in Ethiopia allowed us to obtain a much larger volume of coffee from the Duromina Co-operative located in the Jimma Zone, Western Ethiopia, a favourite from our filter range last year. Coming off the back of the natural Brazil of Pirapitinga and the washed Colombian of El Diamante, V21 and V22 respectively, the Duromina is a perfumed delight, full of dark chocolate, hops and ripe peaches. A pleasure as your morning cappuccino, the mid-afternoon espresso or a delicious little Shakerato, Cult of Done V23 is available in all Workshop stores across London and online now. As Cult of Done v.16 coffees turn their final batches in our Probat we obviously cannot stop the supply of tasty espresso to you, wherever you may be in the world. We therefore have been working hard over the past four weeks on the next two components and are pleased to announce that v.17 is ready for release. A 65/35% split between Aricha, a coffee from the Yirgacheffe region of Ethiopia, and San Francisco, from the Apaneca-Ilamatepec region in Western El Salvador, both coffees have had extensive test roasts performed, many shots have been pulled and consumed, and the best of each have been paired to create the final version. What we have got is a gloriously thick espresso with black cherry and dark chocolate in abundance with a rich, praline sweetness and long finish. Each component has been sourced on recent trips to origin in February this year and we are pleased to have gotten what we went for. The chance to meet the producers, see production facilities, tour the farms and cup is worth it when you pick up great coffees such as these. One terrace of many in the shade covered nursery at San Francisco. The name “Duromina” means “improve their lives” in the local Ethiopian language of Afan Oromo, an apt name considering what the Duromina Cooperative has achieved in its short history. Since being established in 2010 the cooperative has, amongst things other than just producing delicious coffee, paid off a 4-year bank loan after the first year, built a bridge over the river and a local road infrastructure to combat the rainy season, provided electricity to the village, fitted tin roofs on most of the member’s houses and created a local health clinic to bring essential services to those in the area. Not content with improving their locality, the cooperative turned their attention to its own growth. A second washing station has opened to increase capacity, allowing them to buy and process non-members' cherries on top of their own. Working together, output and quality has increased so much so that coffee from the cooperative now sells for nearly five times as much as was received before the creation of Duromina, leading to roughly a 50% increase to each member’s income. All this means coffee is now a viable and rewarding way to make a living for the smallholders of the Duromina cooperative. Workshop are proud to be part of their story and we hope you enjoy this, our first Ethiopian of the season. Coffee lovers in the UK are a lucky bunch. A recent upswell in the appreciation of great coffee, all around the country, means that there’s never been a better time to order a cup. The press, blogs and social media all abound with stories of the latest cafes, roasters and, more recently, baristas who are putting energy and resource into improving this widely loved drink, celebrating them as talented harbingers of quality. And it’s true. A lot of work is required to take what is basically a handful of dried legumes, and turn them into a drink that warrants crossing town to taste. But that quality that coffee lovers seek starts long before any roaster or barista is in the picture. The complexity, clarity and character of flavour that we now expect from roasters and cafes is not the product of the cleverest roasting, the fanciest espresso machine, or even the most ironically mustachioed barista. Though many of us fail to appreciate it, the quality of what we look for in our daily coffee is established long before the beans arrive in Europe. It’s high time to remind ourselves that the coffee we love began the journey to us a long way away, as the seeds of a single ripe cherry, grown on a healthy coffee tree. Just as we appreciate that the world’s best chefs are at the mercy of the producers that supply them, so too are roasters and baristas only capable of producing roasts and drinks of a quality befitting their ever-increasing price tag because of the care and diligent work of the world’s best coffee growers. Coffee is a fickle and fragile fruit. As a tree, it’s susceptible to a wide range of diseases and attacks that can decimate crops: leaf rust, insect infestation and snap frosts to name just a few. During its preparation for export, if not dried correctly, coffee runs the risk of beginning to ferment and rot, resulting in a tainted and unsaleable product. Once dried and sitting in warehouses or on ships, the raw beans undergo organic degradation, turning woody, dry and stale. Even if all these risks are avoided, there’s still a chance that bandits will cut through warehouse locks, or hijack road transportation, and make off with a farmer’s entire year’s work. Coffee production is hard and risky work, but it needn’t be thankless, too. In reality, it’s thanks to committed growers, millers and exporters that we as roasters and baristas have the opportunity to put that ever increasingly delicious coffee into your cup. While it’s certainly true that the skill of baristas, and the quality of coffee being served has never been better, it’s important that as coffee lovers think beyond the barista, and give some thought to those responsible for growing our coffee. When our freshly harvested lots arrive from Kenya and Ethiopia in a few weeks time, I’ll be reminding our baristas of my recent travels to farms there, and all the people that I met. And when customers thank our baristas for the great coffee they serve, I trust that they’ll remain humble and deferential, because we don’t magic up the quality in the customer’s drink, we’re merely a conduit that helps to maintain it from farm to cup. We’re very pleased to introduce a couple of new coffee offerings to the range. First up, the Kabingara AA from Kiringaya, Kenya. This coffee was harvested in December 2012 and kept in parchment right up to being dry milled and then immediately vacuum-sealed into 15kg bricks for shipping. These efforts have enabled the coffee to maintain a fresh and lively character, with superb aromatics and real clarity of flavour. You’ll experience some classic Kenyan traits like a winey, blackcurrant acidity and a full, juicy body. Also, there are some wonderful rose hip aromatics that really fill out the cup. Next up we have v.14 of the beloved Cult of Done Espresso. As with the La Ilusion, which made up 100% of v.13, we felt this coffee benefited from remaining unblended. That’s right, the Hunkute from Sidamo, Ethiopia needs no helping hand in creating a full, rich, aromatic espresso. We’ve really enjoyed having the Hunkute as a filter option, and after hitting upon the right roast profile, we’ve fallen in love with it all over again. As an espresso you can expect some real honeyed sweetness with incredible floral aromatics! This coffee is surprisingly forgiving, and tastes treacly and wonderfully textural in a tighter, punchier shot. It then becomes incredibly elegant, silky and balanced when pulled slightly longer. In milk you’ll experience flavours of apricot jam, producing a very decadent cappuccino.